Bullion Bank Run: Will Bullion Prices Fall Further Then Climb to New Heights Again? 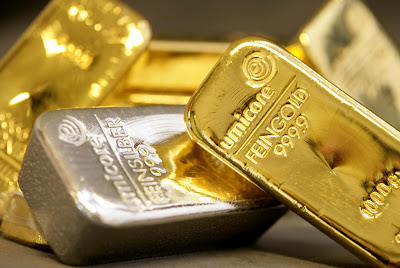 Will Bullion Prices Fall Further Then Climb to New Heights Again? Throughout 2012, bullion prices have been rather lackluster. Investors saw silver jump to $35 in February, but fall since. Gold has also seen a sharp drop. Does this spell the end for bullion or is this just a temporary adjustment for goldbugs? Since February, silver has dropped steadily from more than $35 an ounce to just over $26. Although many analysts are expecting bullion prices to excel over the coming years, some are scratching their heads at the sudden drop in silver. Its precious metals companion, gold, has also seen a significant decline in its value. Upon analysis of the charts, gold bullion reached an astounding $1,921 in September of last year, but it has fallen to just under $1,600 since then. Are reports of deflation in the United States economy triggering a slowdown in bullion prices? Is a stronger United States dollar also keeping a lid on bullion prices from reaching further success as precious metals have since the year 2000? The latest technical analysis from ScotiaMocatta, part of Scotiabank Global Banking and Markets, suggests that if silver bullion falls to $26 then it could potentially begin liquidation and fall to $18 an ounce. “We believe a break of $26.00 has the ability to trigger liquidation of silver with it looking for $18.00,” wrote the bullion bank in its report. According to the analysis, this could be a much bigger picture for a dip in gold prices. “The broader picture suggests gold could move a bit lower, but it will stay in this range until we see definitively whether the bulls will be right about the printing presses at central banks ramping up again, or whether they will hold fire until the world gets a lot worse," said Macquarie analyst Hayden Atkins. India, one of the largest buyers of bullion, especially gold, has been hurt by a terrible monsoon season as well as a weakened Rupee currency. This has led the Indian government to keep its bullion purchases flat. Also, demand for bullion in several of the key Asian markets has remained levelled. “South East Asian players have been doing well at picking up the slack but of late they have not,” stated Standard Bank in a note from its commodities strategists. One analyst said the fear of inflation is over and there will be most likely a pullback from bullion and a jump into U.S. Treasuries. “There is zero inflation out there. With gold being well received as a risk asset, the price is deflated because of the rising dollar,” said Phillip Streible, senior commodities broker at futures brokerage R.J. O'Brien, in an interview with Reuters. Nevertheless, despite the drop in prices, some banks remain certain that bullion will soar once again. The Royal Bank of Scotland told Bloomberg News (via the Globe and Mail) Friday that gold will climb to $1,800 by the fourth quarter, but then sink once again. “From there, we reiterate our view that this move will be a 'last hurrah' for gold," the bank said. "We continue to see a downtrend commence from that point, which should see gold gradually fade to average $1,200 an ounce by 2015." In the morning trading session, silver was up 0.26 percent to $26.74USD and gold also saw a 0.32 jump to $1,572USD.